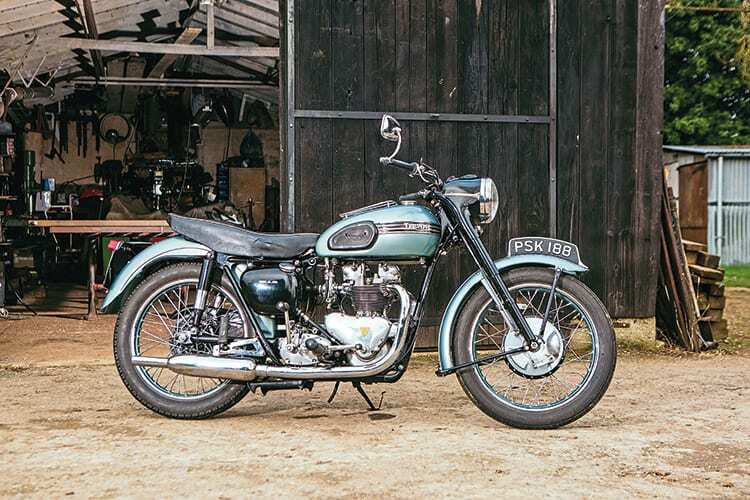 In 1951, when Wiltshireman Cyril Griffin was called up for National Service, he bought a 1950 Triumph Speed Twin for trips home on leave weekends. Being stationed at Epsom with the Experimental Mobile Column, an early part of the Civil Defence organisation, meant a 160-mile round trip. The sprung hub 500 handled the regular journeys with no major problems. Once a cable broke, but Cyril improvised and got home. The only real incident came when the petrol tank developed a split en route. But Cyril, prudently, had joined the AA, and in less than half an hour a patrol on a yellow BSA outfit had stopped, looked at the problem, gone away and returned shortly with a bar of soap that, once moistened, sealed the tank effectively enough to get Cyril home. “Otherwise it was a reliable bike,” said Cyril, “and that impressed me.” But after de-mob in 1953, his next set of wheels was a 1954 Mk.1 Ford Consul. It would be another 40-odd years before, with family grown, he was able to get back to motorcycling. Cyril is now a well-respected Wilts VMCC member and a meticulous restorer of mainly prewar machines; his immaculate 1930s BSA G14 side-valve V-twin in particular had my mouth watering. As an agricultural engineer by trade (and still much in demand locally), with the old bikes “I do everything myself,” he confirmed – and that includes not just engine work, welding and paint, but fabrication work on petrol tanks – so now he could have fixed that 5T’s tank himself.